Rejuvenate the mood of your loved ones with this Incomparable Teddy Bear and Chocolates which is as sweet as your pure love. 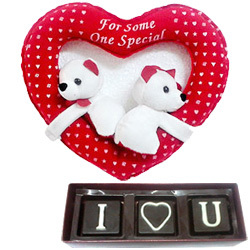 This Special Gift includes 3 Pcs "I Love You" Homemade Chocolate, Couple Teddy Bear in Heart Shape Cushion. The size of the gift is 18 cm.